We have a very tall, sturdy, healthy 60-year-old oak tree only a few feet from our house that leans directly above our second floor bedroom. And we couldn’t believed how it swayed, like some delicate flower, in the howling winds, looking ready to topple over into our roof any second. (The tree survived the storm, and I hope all readers in Sandy’s path are equally safe and sound). Later in the week: Halloween, which always means resolving not to eat any candy meant for trick-or-treaters. And then caving and sneaking way too much chocolate. 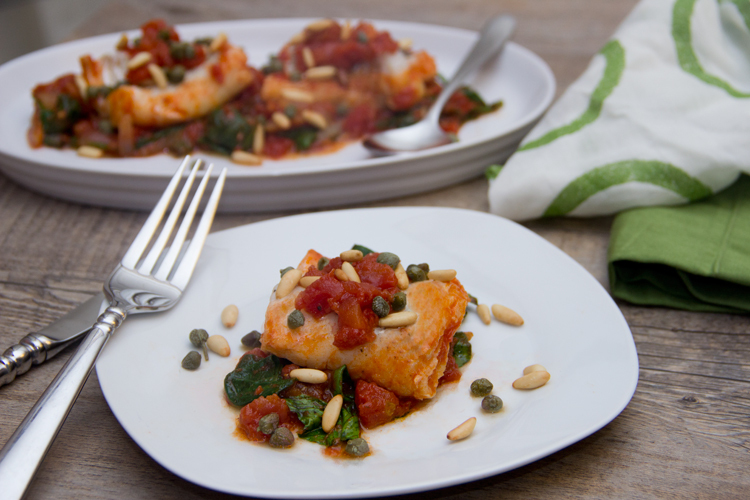 So I thought this Cod Poached in Tomato Sauce was perfect for today because it’s the opposite of everything I’ve eaten all week: it’s full of light, nutritious, healthy ingredients (fish, tomatoes, spinach, pine nuts – yum). It’s very tasty with delicious Mediterranean flavors, and it’s also conveniently quick, ready in about half an hour. Here are all the key ingredients you’ll need to get started. 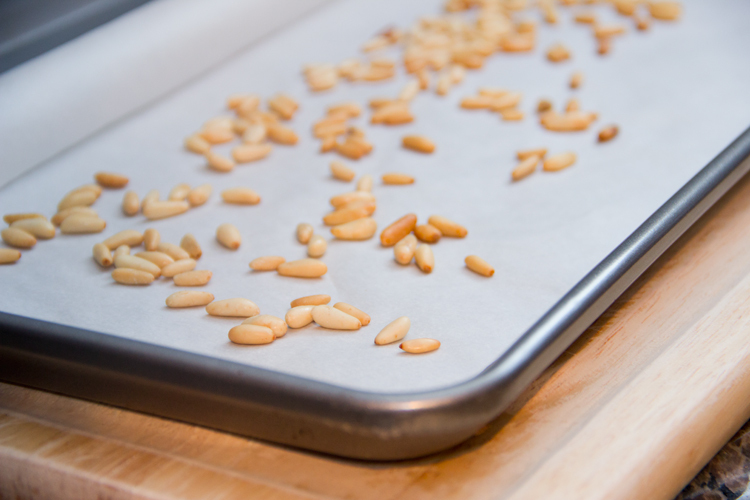 Arrange some pine nuts on a parchment-lined baking sheet and toast the pine nuts for about 5-7 minutes. They should be lightly golden when you remove them from the oven. Set them aside for now. 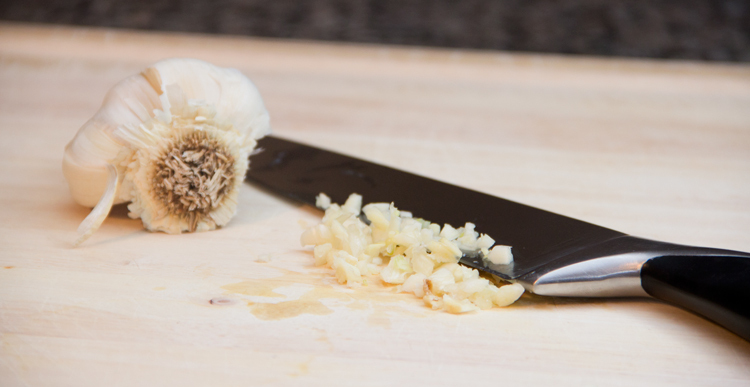 Place a knife over a clove of garlic and press down hard, smashing the clove and removing the skin. Then mince up the garlic. 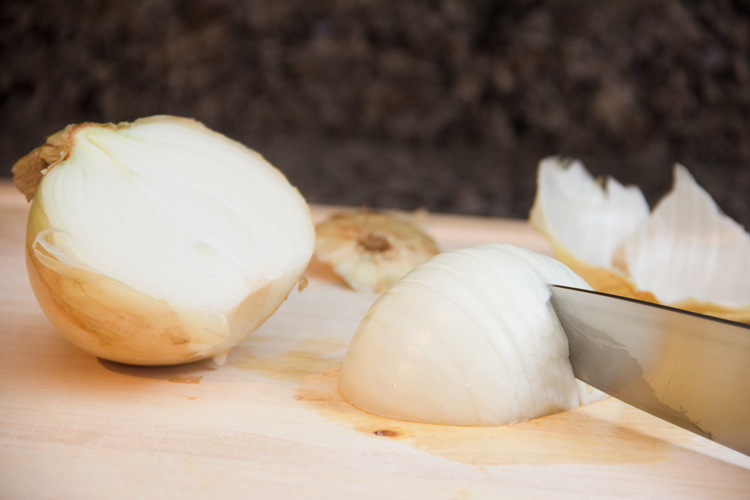 Chop the end off of an onion and cut it in half lengthwise. 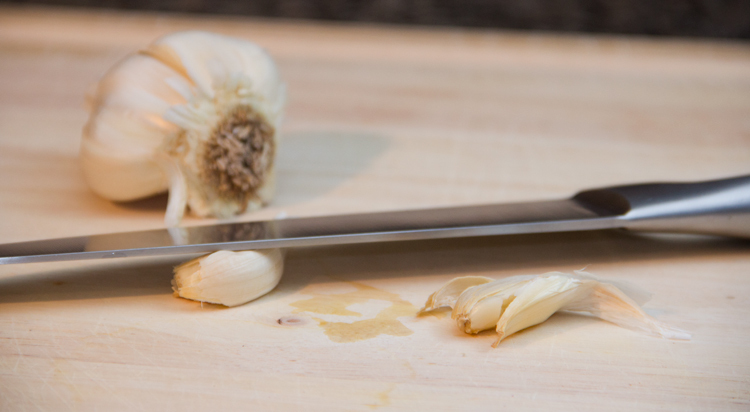 Peel off the skin and place one half flat-side-down on the cutting board for stability. 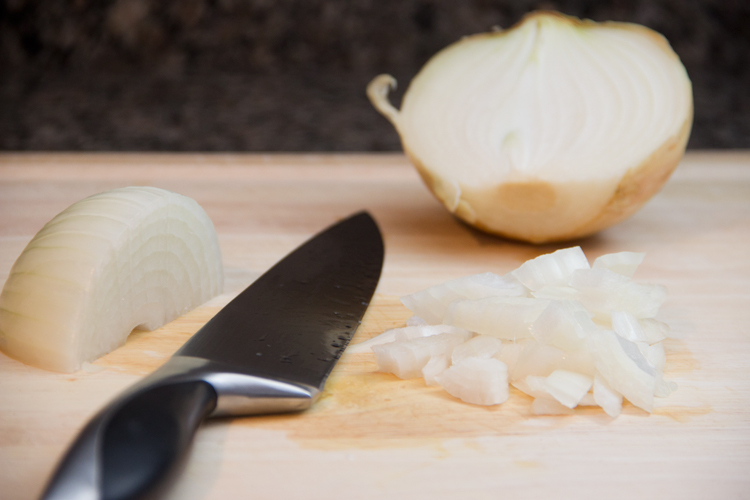 Cut quarter-inch slices of onion lengthwise. Then cut in the opposite direction, chopping up the onion. 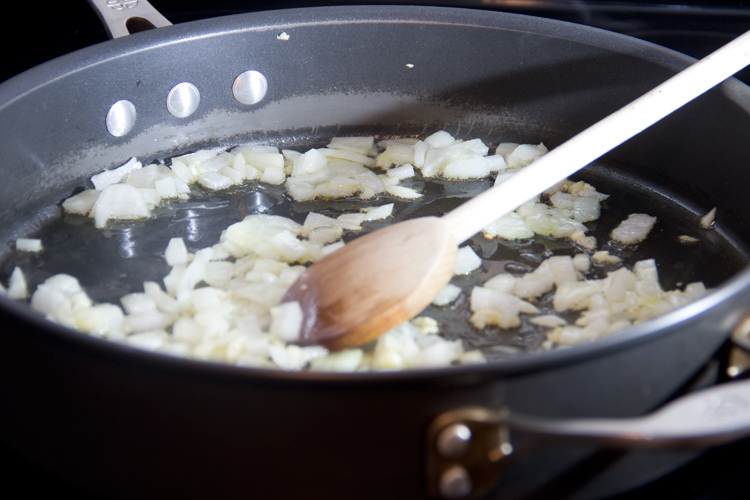 Heat a large sauté pan over medium-high heat and add some olive oil. Then sauté the garlic and onion until they’re nicely softened. This is really all it takes to make the kitchen smell delicious. Next, divide a pound of cod into four portions. Try to keep the portions as equally sized as possible so they’ll cook evenly. Everyone always talks about salmon as the best source of omega-3, but cod also is a good source (among other health benefits, omega-3 fatty acids have been shown to improve heart health and blood pressure, and eating a couple servings of fish each week has been shown to reduce the risk of heart attacks and strokes). If you can’t find cod locally, any mild white fish would work in this dish: halibut or haddock are great alternatives. Next, add the chopped tomatoes with their juices to the sauté pan and adjust the heat to a light simmer. Arrange the fish in the pan so that the pieces are not overlapping. 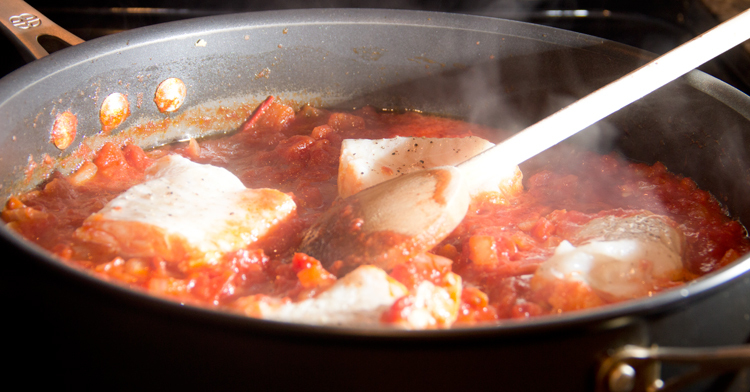 Cover and allow the fish to cook in the lightly simmering tomatoes. Here’s what I love about cooking fish using the poaching method: it’s basically foolproof. In my experience, cooking fish with just a bit of oil in a sauté pan usually turns into Kitchen Disaster, with half the fish stuck to the pan, the other half broken into ten flaky bits. But the liquid from the tomatoes in this recipe keeps the fish from sticking. And it adds rich tomato flavor to the fish as well. When you see that the top of the fish has changed from translucent pinkish-white to solid white, you’ll know the fish is cooked through. Use a spatula to transfer the fish to a platter, and lightly tent the platter with foil to keep the fish warm. Then add lots of baby spinach leaves to the sauté pan. Also add the toasted pine nuts and some dried oregano. You can find delicious jarred capers in the grocery, typically next to the olives. They add a very tasty briny, salty mediterranean flavor to the dish. I like to add salt and pepper only at the end for this particular recipe, mainly because the capers are so salty and it’s easy to go overboard. Spoon the tomato sauce all over the fish and serve – it tastes delicious over brown rice. This recipe is perfect for when you want a very flavorful, healthy dish that tastes like you really toiled in the kitchen, when you actually didn’t at all. 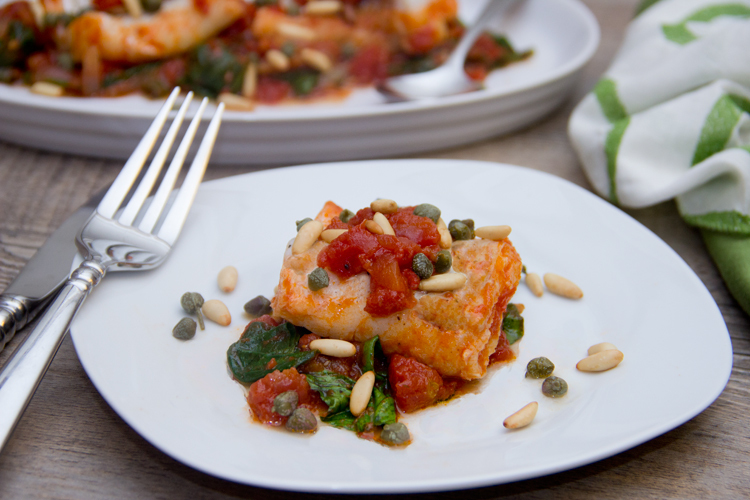 The mediterranean flavors of rich olive oil, savory tomatoes and garlic, and crunchy pine nuts are so delicious with the moist, flaky poached cod. 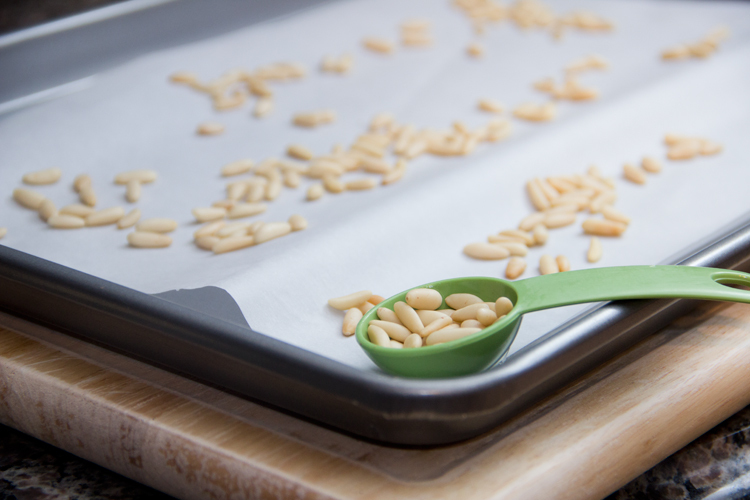 Arrange the pine nuts on a parchment-lined baking sheet and toast the pine nuts for about 5-7 minutes, or until they are lightly golden. Watch carefully - they burn quickly! Meanwhile, heat the olive oil in a large sauté pan over medium-high heat. Add the minced garlic and diced onion and cook until softened, about 5 minutes. 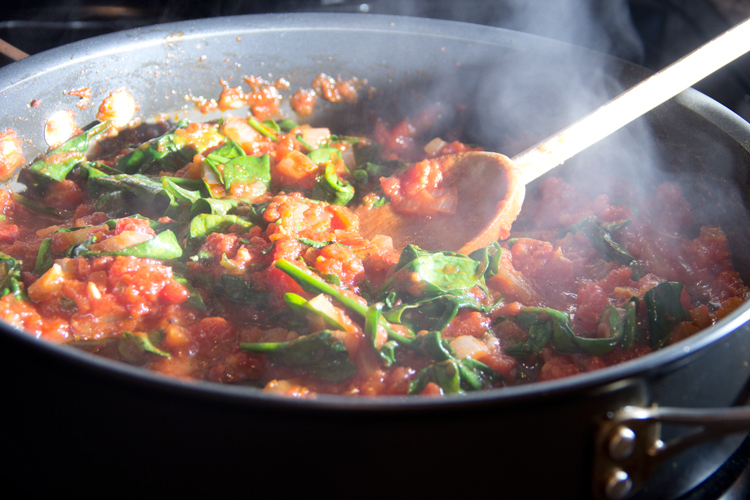 Add the chopped tomatoes with their juices, and adjust the heat to a light simmer. 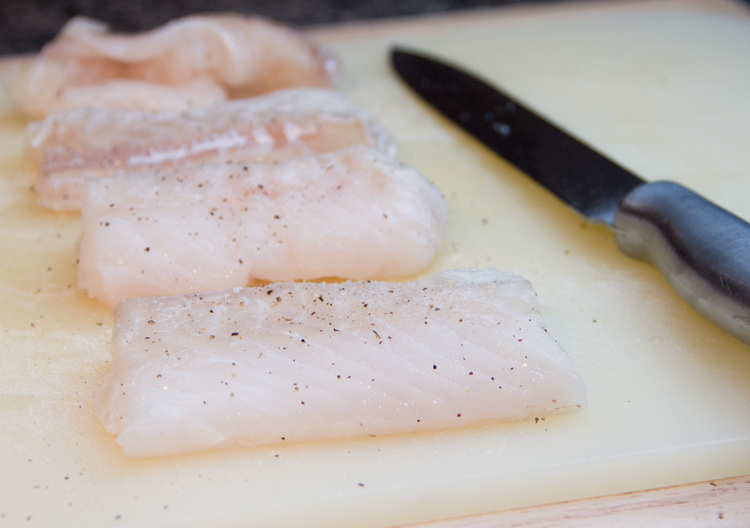 Divide the cod into 4 equally-sized portions and season with salt and pepper. Place the fish in the lightly simmering liquid, cover, and cook for about 7-9 minutes, or until the fish is cooked through. Use a spatula to remove the cod from the pan, place on a platter, and tent with aluminum foil. Add the spinach, capers, and dried oregano to the pan. Cook until spinach is lightly wilted, about 3 minutes. Season to taste with salt and pepper. Stir in the toasted pine nuts, spoon the sauce all over the fish, and serve. 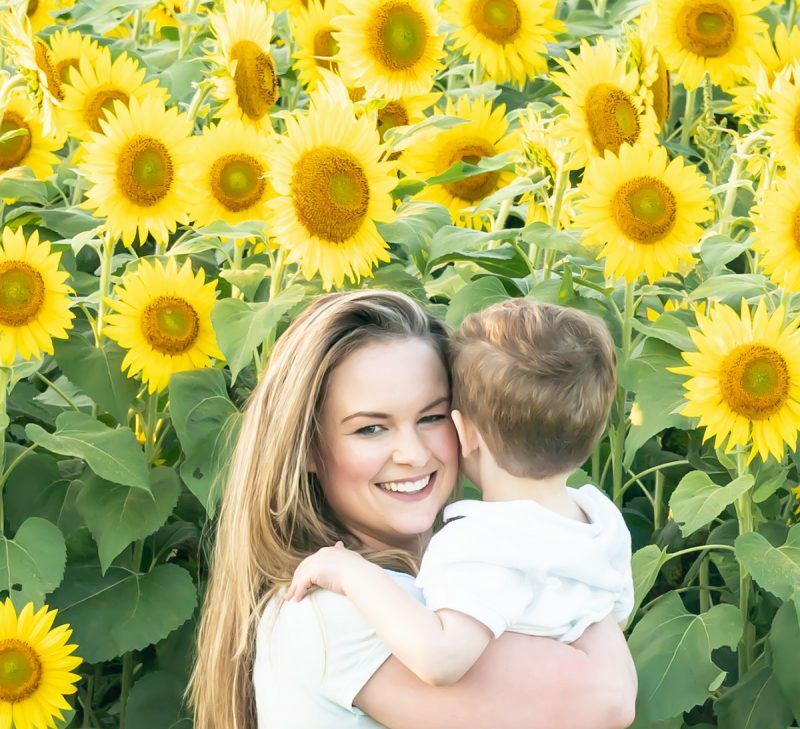 Really nice… and great step-by-step shots! That looks so delicious and pretty easy to make. My husband hates fish, but is going out of town for work for a month so I can eat all the fish I want. I’m definitely going to make this next week! Thanks for the recipe. On a more positive and food-related note: this dish looks absolutely delicious – I’ll definitely be trying it out soon since I’ve been wanting to try new recipes with fish! I’m glad you’re safe!! It must have been so scary!! This looks amazing, and I don’t even care for fish. 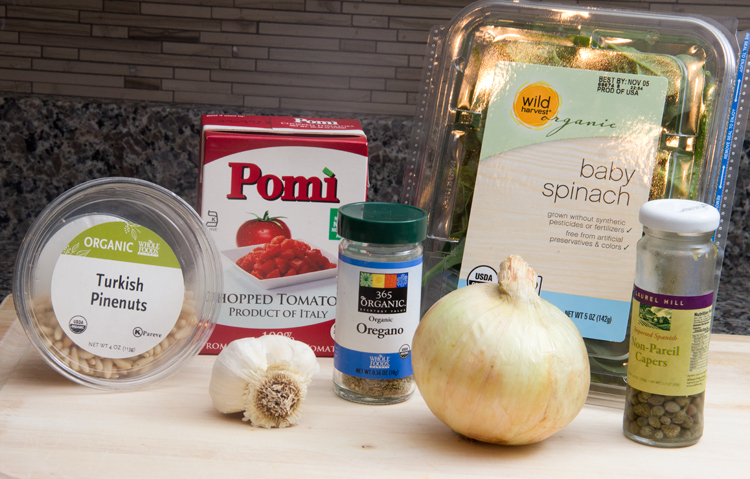 I make it every few months to keep my hubby happy… I’ll give this a try since I <3 Mediterranean flavors. Yum! Great news that you, yours and your worryingly flexible tree made it through what Hurricane Sandy had to throw at you! It’s been unreal. This looks so tasty and fresh and satisfying; definitely something I’ll want to try the next time I’m cooking up some fish. This sounds so good! Glad you stayed safe during the storm…we got hit too in upstate NY but not as bad as everyone thought. We managed to not lose power so I’m very thankful. No fish skin sticking to the pot? You’ve got my attention 😉 haha, but seriously, this sounds so flavorful! I’ve gotta try cooking fish in tomato sauce soon. Looks so good – I’ve had a craving for cod will definitely give it a try. That looks so GOOD! It’s a must try very soon! TY! Beautiful recipe, even if I cannot guarantee cod in semi-rural Australia. It does sound you have electricity with which to cook 🙂 ! Love the fact you specified ‘wild cod’ as am not overly friendly with farmed fish . . .
Glad you guys are safe! And this cod is absolute perfection! I’m not much of a capers person but Jason swears by it so I totally need to make this for him! Glad that nothing came crashing down around you. Your cod sounds like a delicious meal. This is something for me …. love everything in this dish – thank you so much. Wonderful post, Jen. Yum! I love poaching food- much healthier in tomato sauce than butter 🙂 This recipe looks like it’s full of flavor! What a great way to eat fish, and add tons of flavor to the dish. I’m adding this to my ever growing list of “things to try soon”…whenever “soon” is, I’m not quite sure! LOL! This meal does indeed look delicious, and good for balancing out that candy! I definitely fell prey to the chocolate, I swore it was constantly calling my name! So glad to hear you guys are safe and that the tree stayed put! Everything about this dish looks perfect to me..I LOVE all forms of fish and the sauce you made up looks teriffic. 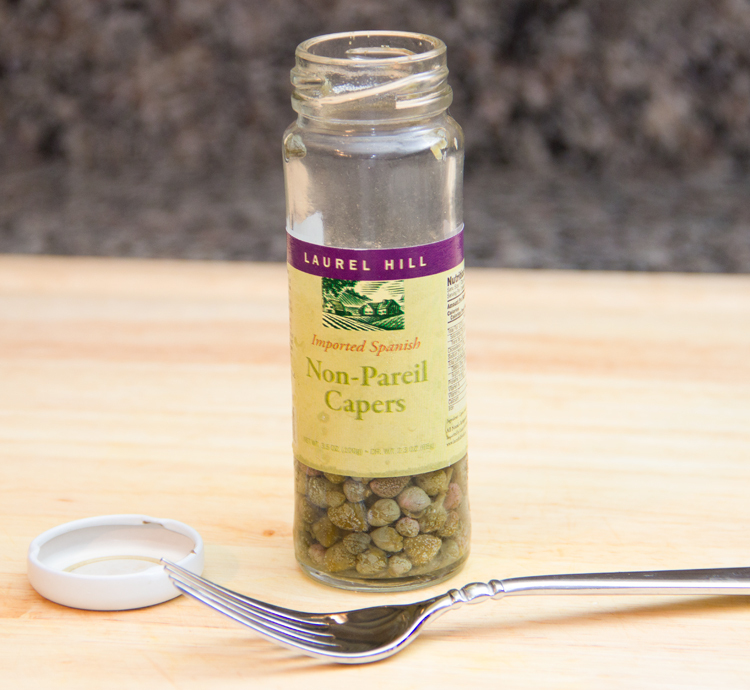 I’m big on capers, too…and pine nuts…yum! My boyfriend and I will enjoy this dish soon! I have a freezer full of cod begging for a creative, tasty recipe… this is it! Thanks for sharing! this looks so professional. really nice job on this recipe. i love capers over grilled fish with tomatoes, had it with salmon in Puerto Rico and fell in love. This reminds me of that dish. a mouthwatering one. Just like the sicilian recipe. This looks delicious. I often forget about poaching as a cooking method for fish, so thank you for the much-needed reminder. I am going to try this recipe soon! Glad to hear that you’re safe and sound! This is one for … a lonely diner – love all the ingredients here … has to tried out very soon. Love capers with fish. Will come back with verdict. Thanks a million for this. Looks lovely. Glad you made it through the storm ok! Glad you guys are ok! What a scary time it has been, so devastating for so many. And, I love the simplicity of this dish and addition of tangy capers – yum!